In projections of twenty-first century climate, Arctic sea ice declines and at the same time exhibits strong interannual anomalies. Here, we investigate the potential to predict these strong sea-ice anomalies under a perfect-model assumption, using the Max-Planck-Institute Earth System Model in the same setup as in the Coupled Model Intercomparison Project Phase 5 (CMIP5). We study two cases of strong negative sea-ice anomalies: a 5-year-long anomaly for present-day conditions, and a 10-year-long anomaly for conditions projected for the middle of the twenty-first century. We treat these anomalies in the CMIP5 projections as the truth, and use exactly the same model configuration for predictions of this synthetic truth. We start ensemble predictions at different times during the anomalies, considering lagged-perfect and sea-ice-assimilated initial conditions. We find that the onset and amplitude of the interannual anomalies are not predictable. However, the further deepening of the anomaly can be predicted for typically 1 year lead time if predictions start after the onset but before the maximal amplitude of the anomaly. 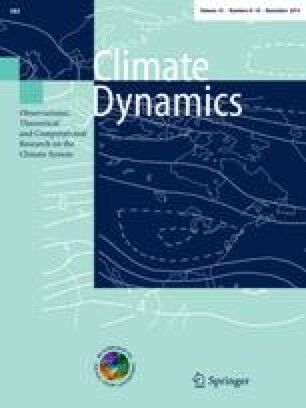 The magnitude of an extremely low summer sea-ice minimum is hard to predict: the skill of the prediction ensemble is not better than a damped-persistence forecast for lead times of more than a few months, and is not better than a climatology forecast for lead times of two or more years. Predictions of the present-day anomaly are more skillful than predictions of the mid-century anomaly. Predictions using sea-ice-assimilated initial conditions are competitive with those using lagged-perfect initial conditions for lead times of a year or less, but yield degraded skill for longer lead times. The results presented here suggest that there is limited prospect of predicting the large interannual sea-ice anomalies expected to occur throughout the twenty-first century. The online version of this article (doi: 10.1007/s00382-013-1698-8) contains supplementary material, which is available to authorized users. We thank all colleagues in Hamburg developing MPI-ESM and performing the CMIP5 simulations for technical support of this study at an early stage of model dissemination. We also thank two anonymous reviewers for thoughtful comments that helped to improve the manuscript. This work was supported by the Max Planck Society for the Advancement of Science and the International Max Planck Research School on Earth System Modelling. All simulations were performed at the German Climate Computing Center (DKRZ) in Hamburg, Germany.